What country has the most Miss World winners: India or Venezuela? 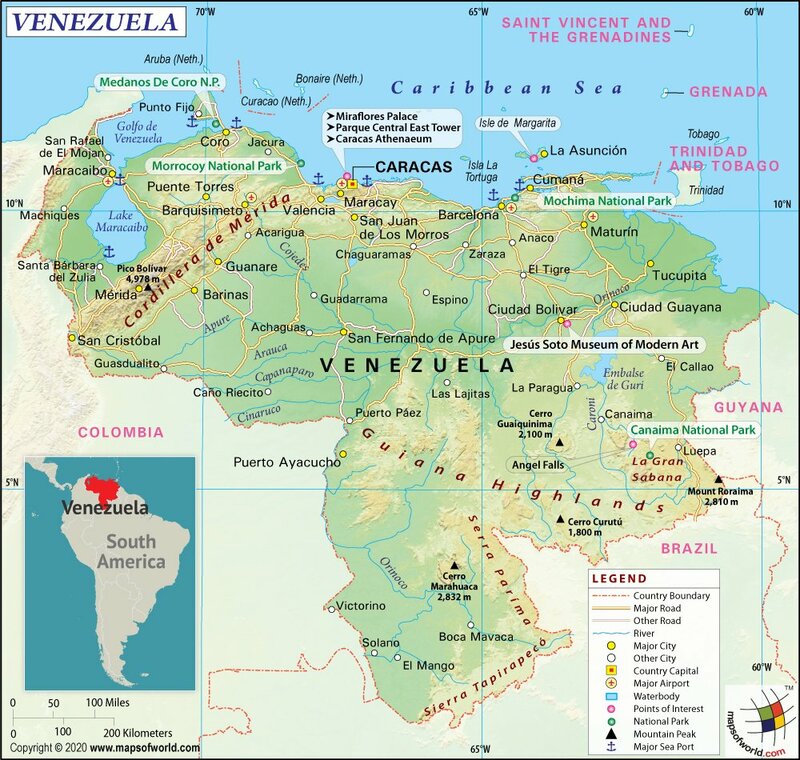 The Bolivarian Republic of Venezuela is a tropical country situated on the northern coast of South America. It is bordered by Colombia to the west, Guyana to the east, and Brazil to the south. Flag of Venezuela was officially adopted on March 12, 2006. The tricolor flag consists of horizontal stripes of yellow, blue, and red. The blue stripe in the middle also has a set of eight stars. An optional coat of arms is included at the top-left corner of the flag. Christopher Columbus was the first European to arrive in the region of Venezuela. He discovered the region during his third expedition of the New World in 1498. Upon his arrival, he found that several groups of tribes like Arawak, the Carib, and Chibcha Indians were inhabiting the land. Spanish explorers came in 1521 and colonized the northeastern coast. By 1522, Nueva Toledo became the first Spanish settlement in South America. It was the Spanish explorer Alonso de Ojeda who named the region Venezuela, which means "Little Venice," after seeing houses built on stilts at Lake Maracaibo. In 1567, Caracas, the capital city, was founded. During the late 1700s, movements for independence against the Spanish rule started to begin. Venezuela was a neglected colony with much of its natural resources exploited by Spain. In 1810, Venezuelan independence leaders took advantage of Napoleon Bonaparte's invasion of Spain and declared independence on July 5, 1811. On that precise day, the Congress of Venezuelan provinces signed the Venezuelan Declaration of Independence. However, the Act met with resistance from the Spanish leaders, leading to the Venezuelan War of Independence. Liberation came in 1821 when Simon Bolivar won the Battle of Caraboro, freeing several Spanish colonies (Colombia, Panama, Ecuador, Bolivia, and Peru) in South America. Bolivar formed the republic of Gran Colombia, which included Venezuela, Colombia, northern Peru, Ecuador, Panama, northwest Brazil, and western Guyana. The republic was short-lived and Venezuela became a separate independent nation in 1830. Venezuela lies on the northern coast of South America. It has a total of 2,800 km of coastline in the north and its territory includes a number of islands in the Caribbean as well as in its northeast border facing the Atlantic Ocean. The land is divided into four regions: the wide Orinoco plains in central Venezuela, the northern mountains, the Maracaibo lowlands in the northwest, and the Guiana highlands in the southeast. 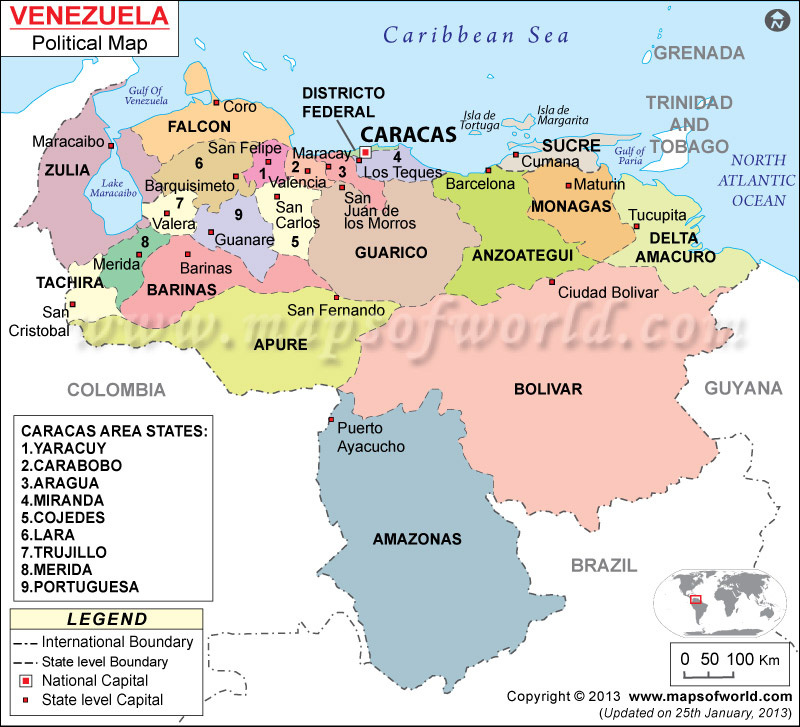 Venezuela is bordered by Colombia to the West, Guyana to the east, and Brazil to the south. From peaks to savanna grasslands and Caribbean coastline to flat-topped mountains, Venezuela is known for its geographical diversity. The country also has the highest waterfall in the world. This tropical country also has a vast range of flora and fauna. While Pico Bolivar is the highest point at 16,427 ft. (5,007 m), the Caribbean Sea (0 ft) is the lowest point. Venezuela is a federal presidential republic governed by a Constitution. The President is the chief executive, head of state, head of government, and head of a dominant-party system. The United Socialist Party of Venezuela is the dominant party. While the President exercises the executive power, the legislative power lies with the 165-member National Assembly. Venezuelan economy remains overtly dependent on revenue earned from oil exports, which account for about 96% of total export earnings. In 2014, the country witnessed a 4% contraction in its GDP. According to the IMF, the GDP is likely to shrink by another 7% in 2015 and inflation may reach 80%. President Nicolas Maduro has increased state control over the economy. However, rigid labor regulations and price controls have forced multinational firms to shut down or scale down their Venezuelan operations. Venezuela is rich in natural resources but its economic dependence on oil exportation has led to the neglect of tourism industry. Because of this, the tourist infrastructure in Venezuela is not at par with the international standard. However, the tourism sector is taking action towards achieving the goal of attracting at least one million foreign travelers each year. Venezuela is endowed with historic cities. Caracas,the capital city, is a progressive and multi-ethnic city that is known for a thriving nightlife, premier restaurants, museums, and historic areas. Among the must-visit destinations are Plaza Bolivar, The Cathedral, Government Palace, and the City Hall. Canaima National Park is Venezuela's most popular tourist destination, mainly due to the Angel Falls - the highest waterfall in the world. At 1002 meters, it is 19 times higher than the Niagara Falls. The park itself totals 30,000 square kilometers, where tourists can spot rare and interesting flora and fauna. Margarita Island, a favorite among international tourists, is located on the east of Caracas. It has a vast coastline packed with lagoons and beaches. It's a perfect destination for surfers and sunbathers. The eastern and the most developed part of Margarita Island has an array of clubs, hotels, duty-free shopping hubs, and colonial architecture. On its west lies the arid mountains. Venezuela sets a high standard of education. Its literacy rate is 96.3%, which is higher than most South American countries. However, poverty in the rural areas forces children to skip school and contribute as a breadwinner for the family. Students in primary school attend classes in shifts: either from early morning to 1:30 in the afternoon, or early afternoon till 6 in the evening. Education in Venezuela starts in preschool and the first nine years of formal education is compulsory. Higher education in public universities is free and there are over 90 institutions in the entire country. Hugo Chavez- A "21st century socialist" and an erstwhile President of Venezuela. Patricia Velasquez - Venezuelan-born Hollywood actress with movies like Beowulf, The Mummy, and Almighty Thor to her credit. Venezuela was the biggest oil exporter in the world in the early 1900s. In fact, it is one of the founding members of the OPEC. Unlike most other South American countries, Venezuela's most popular sport is baseball. Most of the Miss Universe and Miss World winners are from Venezuela. Venezuela owes its nickname, 'Land of Grace', to Christopher Columbus. Venezuela is home to Capybara, the largest rodent of the world.